A recent study authorized by the Ministry of AYUSH has shown that it is possible to significantly improve the quality of life of drug users and also reduce the frequency of their drug use with the help of Yoga interventions. The study concluded this year at the All India Institute of Medical Sciences (AIIMS), New Delhi and was funded under the Extra Mural Research (EMR) scheme of the Ministry of AYUSH. The study used Sudarshan Kriya Yoga (SKY) and meditation as an adjunct with regular treatment among a group of drug addicts specially heroin users. Eighty four drug addicts i.e. Heroin users undergoing treatment at a community based clinic of National Drug Dependence Treatment Centre (NDDTC) in East Delhi participated in the study. It was a randomized study with control groups. The control group was given standard treatment i.e. pharmacotherapy (opioid substitution therapy) and psychosocial intervention whereas the study groups besides standard therapy was clubbed with SKY program over 3 days in a workshop mode and were also encouraged to practice the technique at home every day. It was also advised to participate in a weekly follow-up SKY programme. The standard screening measure was adopted (urine screening ) and it was observed that there was Higher percentage of relief seen in the group of users who were treated with standard treatment along with Sudarshan Kriya Yoga (SKY) and meditation in comparison to control group of heroin users . 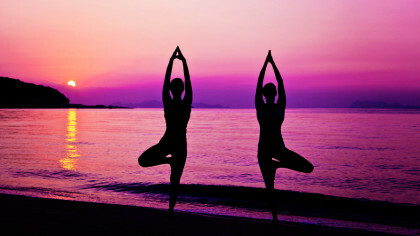 Overall, the study showed that yoga intervention produced a significant change in the physical, social relationship and environmental domains of quality of life and also reduced the frequency of drug use as evident by the urine screening results as compared to the control group that was on treatment as usual. Study findings also suggested that the yoga intervention can be used as an adjunct to standard intervention to improve the quality of the life of drug users and also to further reduce the frequency of their drug use. More studies need to be carried out in different settings with a larger sample size to replicate the findings of this study.